Houghton Mifflin Harcourt, 9780395963715, 304pp. Explore the Expanding Peterson Line. Leave your reading glasses behind. 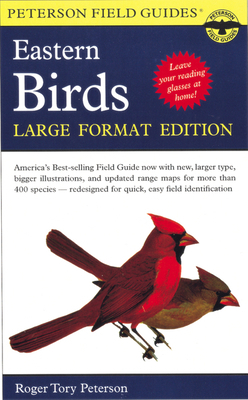 Now Roger Tory Peterson's classic Field Guide to Eastern Birds has been reissued in a larger format specially produced for those who don't want to take their reading glasses into the field. Peterson's treasured illustrations have been reproduced in beautiful color. Species descriptions include only the most important identification elements -- size, voice, and habitat -- in large, easy-to-read type. Color range maps, conveniently located next to the species accounts, have been updated specifically for this book. Roger Tory Peterson's original text has been revised and updated by Virginia Peterson, who worked closely with her husband and created the maps for the fourth edition of the Field Guide to Eastern Birds; Noble Proctor, a professor of biology who was a close friend of Roger Tory Peterson's and led natural history tours for twenty-five years; and Pete Dunne, vice president of the New Jersey Audubon Society and director of the Cape May Bird Observatory, as well as the author of many books on birding. The maps have been updated by Virginia Peterson and Paul Lehman, past editor of Birding magazine and a bird tour leader who has traveled extensively around North America studying bird distribution and identification and has written many articles on these subjects.